Tunisian Crochet, afghan crochet, the afghan stitch and tricot are all names used for the same stitch. There are actually several other names used as well, but these are the most well-known. Tunisian crochet, which is what I will call it, makes a wonderful fabric of perfect little squares. It’s beautiful and strong and has a wonderful texture. And, it’s fun to work. 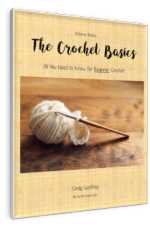 It combines a little crochet and a little knitting to create its own unique method. There are 2 parts to each “row” in Tunisian crochet, the forward pass and the return pass. They are worked right to left in the forward pass and then left to right in the return pass. Your work is never turned. During the forward pass, loops are created on your hook. At the end of this part of your row, there will be many loops on the hook. In the second part, the return pass, the loops are removed 2 at a time. From the description of the stitch, you can tell that Tunisian crochet needs its own unique hook. It’s usually call an afghan hook, but sometimes a Tunisian hook. It looks like a long crochet hook with a stopper on the end. The stopper keeps your stitches from falling off the end of the hook while you’re crocheting. 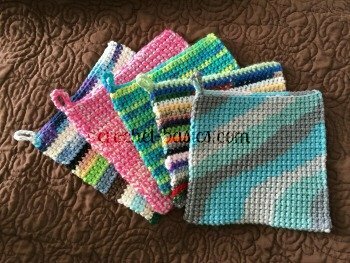 For larger project like blankets or sweaters, there are afghan hooks that have a flexible, nylon cord attached to the end. There is also a stopper at the end of the cord. The cord helps hold your stitches securely while you’re working through your row and it makes it easier to work. After your foundation row, which is also 2 parts, bars are created in your work. Each forward pass that follows is worked into these bars, not into the top loops. This is what makes the little squares in the fabric. Tunisian crochet is like knitting in another way. It tends to curl while you’re working it. This is because there is more yarn in the material on the backside of your work than there is on the front side. One way to help this is to work with a larger hook than is suggested for the yarn. This won’t take away the curl completely, though. A second suggestion is to try different Tunisian stitches that add more weight to the front, such as starting with the Tunisian reverse stitch. 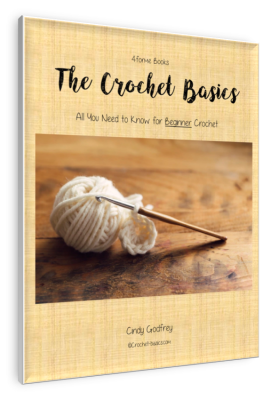 You can find a more thorough explanation here and a tutorial for this stitch as well at Crochet Connection. If you’d like to try some Tunisian crochet, I’ll walk you through a swatch. For our sampler, let’s chain 14. The loop on your hook counts as your 1st loop. *Insert your hook into the 2nd chain from the hook. Remember all the loops that are created will stay on the hook. Repeat * for * across the row. You should have 14 loops on the hook. You’ve completed the forward pass! DO NOT turn your work. We’ll be working left to right now. Yo and pull through the 1st loop. You will always pull through just one loop at the beginning of all return passes. Repeat * to * across until there is one loop left on the hook. You’ve completed the return pass and the foundation row! Remember there are 2 parts to each row, the forward pass and the return pass. There are now vertical bars in your foundation row. You will work your forward pass stitches into these bars. There should be 14 bars because that’s the number of chains we started with. The bar on the very end under the loop on your hook counts as the 1st bar. Insert hook into the 2nd bar. *Insert hook into the next bar. Repeat * to * across. You should have 14 loops on the hook. Repeat * to * across until one loop remains on your hook. Repeat Row 1 (Both forward and return passes) 8 times. You can fasten off here and weave in your ends or you can do a finishing row. In this row we won’t be pulling up loops. We’ll be working slip stitches instead. Insert your hook through the 2nd bar. Yo and pull through the bar and the loop on your hook creating a slip stitch. Repeat * to * across. Entrelac is a variation of Tunisian Crochet. It also uses an afghan (or Tunisian) crochet hook. It creates a pattern made up of colored squares or diamonds. The pattern usually is repeated all through the project. It gives the material a stunning graphic look with the texture of Tunisian crochet. Here’s a great site to learn about it. Entrelac Crochet at Craftsy.